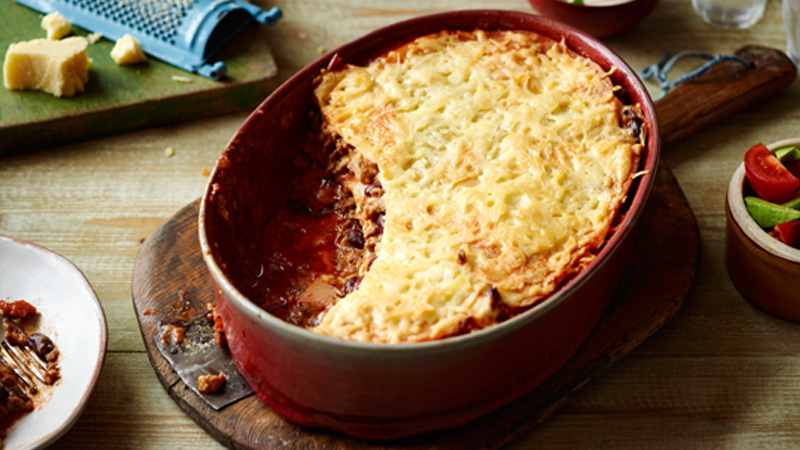 Enjoy this cheesy Mexican lasagne that’s made with sausage, beef and beans – a hearty dinner. 1. Preheat the oven to 180 ºC (160 ºC for fan assisted ovens), gas mark 4. Grease a large baking dish (about 2-2.5 litres). 2. Heat the oil in a large non-stick frying pan and cook the sausage and beef mince over medium-high heat for 5 minutes, stirring, until thoroughly cooked. Stir in the beans, garlic and cumin and cook for a further minute before adding in the chopped tomatoes. Bring to a gentle simmer, season with salt and pepper and cook for 5 minutes. 3. Pour the white sauce, cream of mushroom soup and enchilada sauce into a large saucepan and cook over a medium heat for 3 minutes, stirring, until thoroughly heated. 4. Spoon one-third of the sauce into the baking dish and top with 4 of the tortillas. Spoon half of the meat mixture over the tortillas and then top with another one-third of the sauce and a third of the Cheddar cheese. Lay on another 3 tortillas and repeat the layers with the remaining meat mixture, sauce, Cheddar cheese and tortillas. Finish by scattering over the remaining cheese. 5. Cover loosely with greased foil and bake in the oven for 20 minutes. Remove the foil and cook for a further 10 minutes. Serve with a side salad of the tomatoes and avocado. Dollop on some soured cream and scatter with some coriander leaves for garnish. If you can’t find chopped tomatoes with chilli, use chopped tomatoes and add 1/2 teaspoon mild chilli powder into the pan with the other spices. If you can’t find the mini tortillas, you can use the regular size tortillas but you will need a smaller amount.